← Is your kitchen making you fat? 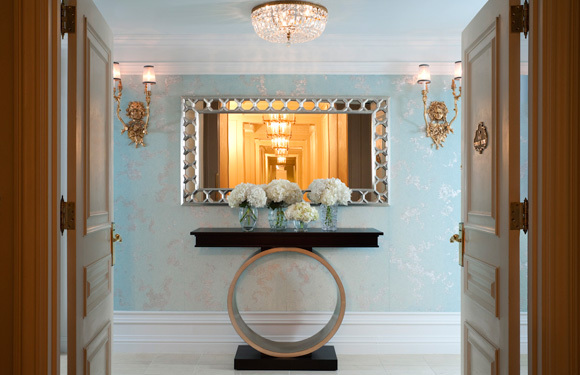 The Tiffany Suite’s decor at the St. Regis New York is “inspired by gem cuts and features lacquer, chrome, and mirror finishes.” It is an elegant space that is covered with today’s muted neutral palette but spiced up with pops of the iconic Tiffany Blue. It is beautiful, yet fairly understated – and almost underwhelming in terms of the details and swankiness that one would expect from a… gulp… $8,500 a night price tag. I do love the mix of metal finishes and what looks like strands of pearls hanging from the chandelier. 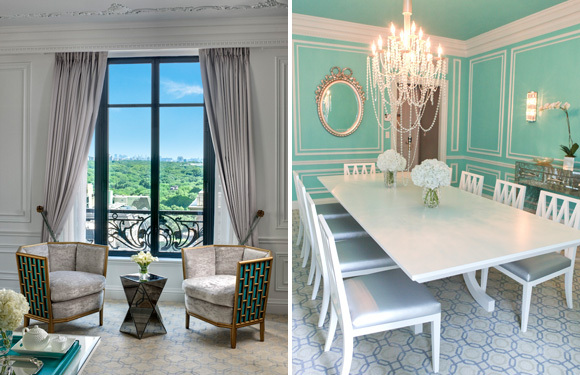 The crisp white walls and trim really make the Tiffany Blue stand out. This entry was posted in Design Examples and tagged Tiffany Blue. Bookmark the permalink.